Even though pediatric cancers are not the same as those in adults, only 2 % of cancer research expenditures are allocated to pediatrics and more than half of current treatments are « off label », meaning that they are not officially authorized for use on children. It is therefore essential to accelerate development of specific treatments and to allow faster access to more effective and innovative treatments for children and adolescents. The association Imagine for Margo is mobilized to: – Contribute to the development of medicine specifically for children – Reduce delays accessing innovative treatments – Favor access to safe clinical trials more appropriate for pediatric oncology We also act within the framework of international working groups to improve cooperation between the various players including the pharmaceutical industry, academics (doctors / researchers), regulators (French and European) and parents’ associations with one goal in mind: to more quickly and effectively develop innovative treatments for children and adolescents affected by cancer. Five working groups including several parents’ associations are monitoring the major themes of the February 15, 2014 colloquium in the Senate “Towards Specific Research on Childhood Cancer” – Group 1: Application of the Cancer Plan 3 Leader: F. Lemos (Imagine for Margo) with J. Lellouche (“Le défi du fortunée) Objective: ensure that measures formalized for pediatric research will be applied correctly and prioritized. – Group 2: – Implementation of a pediatric research program by the major financiers of research (Foundation ARC, “La Ligue contre le cancer”) Leader : F. Sotteau (“un sourire à la vie”) Objective: ensure that these entities will develop research programs focusing on new treatments for children. – Group 3: – Creation of a childhood cancer and research observatory Leader: D. Margerit (“Association Hubert Gouin enfance et cancer”), with J. Michon (SFCE). Objective: elaboration and publication of an annual report defining the objectives for pediatric cancers and indicators of results. 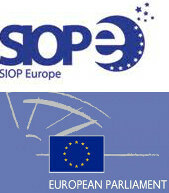 – Group 4: – Modification of European pediatric regulations Leader TBD, with the SIOPE (Société Européenne d’Oncologie Pédiatrique) Objective: to propose changes in regulations to limit the ability of pharmaceutical companies to abandon or to postpone Pediatric Investigative Plans. – Group 5: – Proposal of French and European regulations to encourage specific investments in pediatric research. Leader: Patricia Blanc (Imagine for Margo) with a European working group (representatives from industry, pediatric oncology, members of the Pediatric committee of the European Medicines Agency and parents’ associations). Objective: Following the example of the Creating Hope Act voted in 2012 in the United States, to set up incentives for investment in research specifically aimed at pediatric and adolescent cancer. We are working hand in hand on these initiatives with numerous associations: “Fédération Enfants—cancer-santé », SFCE, « Cent pour sang la vie », « le défi de Fortunée », « le Groupe franco-africain d’oncologie pédiatrique », « l’association Hubert Gouin enfance et cancer », Laurette Fugain, « l’Etoile de Martin », Lisaforever, Princesse Margot, « Tous avec Clément », as well as Kidsvcancer (USA) et ICCCPO (International Confederation of Childhood Cancer Parent Organizations. BDA-ITCC-ENCCA-SIOPE Pediatric Oncology Task Force Approximately one hundred representatives of the pharmaceutical industry, academics (doctors and researchers), regulators (French and European) and parents’ associations met in December, 2011, and again in November, 2013, with the aim of improving development of treatments for children and teenagers affected by cancer. In November 2013, 4 working groups were created. Patricia Blanc leads the working group “Propose new incentives for the development of specific pediatric drugs and the repositioning of drugs that fail in adults”, and is a member of the executive committee of this international task force. Regular meetings are held and preliminary results will be presented in February 2015 during the 3rd seminar. 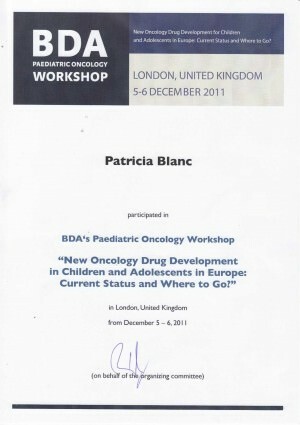 The European working group led by Patricia Blanc is made up of 11 people representing pharmaceutical companies, members of the European Medicines Agency and the European Pediatric Committee, pediatric oncologists and researchers working on the theme: “Propose new incentives for the development of specific pediatric drugs and the repositioning of drugs that fail in adults”. Proposals put forth by this working group will be formalized and submitted to the public authorities in the near future. – November 15th, 2013: participation in the ITCC 10th anniversary day, with more than 120 participants from the medical world. ITCC presented both of the therapeutic trials we finance (VINILO on low grade gliomas and BEACON on neuroblastomas) and Imagine for Margo, who also presented 2 years of partnership with ITCC, was warmly thanked for its support. An immense thank you to all of our donors who are helping advance pediatric cancer research. November 18-19th, 2013: BDA international seminars. Pharmaceutical companies, researchers, regulators, and parents’ associations gathered together: it was rather unique! Discussions about European legislation, “US Creating Hope”, cooperation and treatment innovations. An action plan was developed with 4 working groups. Imagine for Margo is participating in the one that will study a “European Creating Hope Act” (in other words: how can we directly develop medicine specifically for children, without using those of adults?). 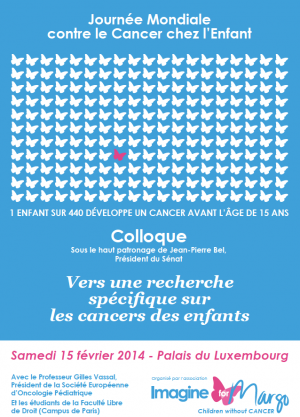 An initial proposal will be presented to the Senate by law students from the Faculty of Lille on February 15th, International Childhood Cancer Day. 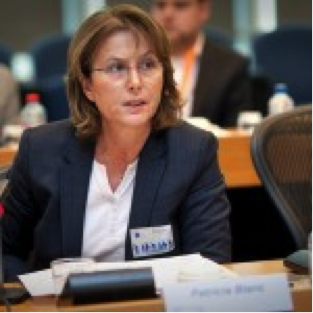 Patricia Blanc is also a member of Steering Committee which will coordinate and follow the progress of the 4 working groups. A lot of progress has been made since our first intervention for the BDA meeting at the end of 2011: there is more dialogue and more will to cooperate. But we need to move even faster and cooperation has to improve, so that we can increase development of better, more specific, effective and targeted treatments. 2013: mobilization during discussions about the Cancer Plan 2014 – 2019 (Cancer Plan 3) Throughout 2013, during discussions about Cancer Plan 3, we strongly campaigned ministries, representatives and senators to ensure that measures covering development of pediatric research could be included in the new plan. Imagine for Margo mobilizes strongly so that a specific budget is allocated to pediatric research in the Plan Cancer 3 currently under discussion. 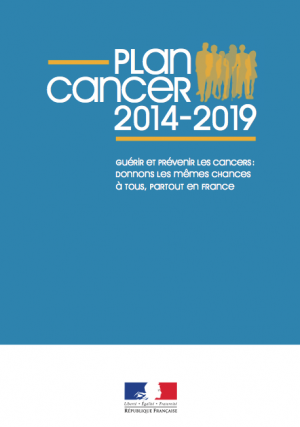 In addition to the proposals we sent to Pr Jean-Claude Vernant, in charge of providing recommendations for the Cancer Plan 3, we led several actions: – Ministry of Social Affairs and Health – March 16th, 2013, Interview with Mrs Catherine Bismuth, adviser to Health Minister Marisol Touraine – Senate – May 09th, 2013, Questions asked by Yveline’s Senator Alain Gournac to the Health Minister Marisol Touraine, answered in session on July 24th – Elysée Palace – September 17th, 2013, Interview with Pr Lyon-Caen, adviser to François Hollande for Health and Medical research. – In February 20th, 2013: International Childhood Cancer Day at the European Parliament Intervention on the bill concerning pediatric clinical trials. Patricia Blanc’s speech during World Childhood Cancer Awareness Day challenged members of Parliament on the small number of innovative and specific treatments for children and teenagers and the lack European clinical trials. She requested simplification of administrative procedures which take too much time and energy, as well as the implementation of an European specific fund dedicated to research on childhood cancer. 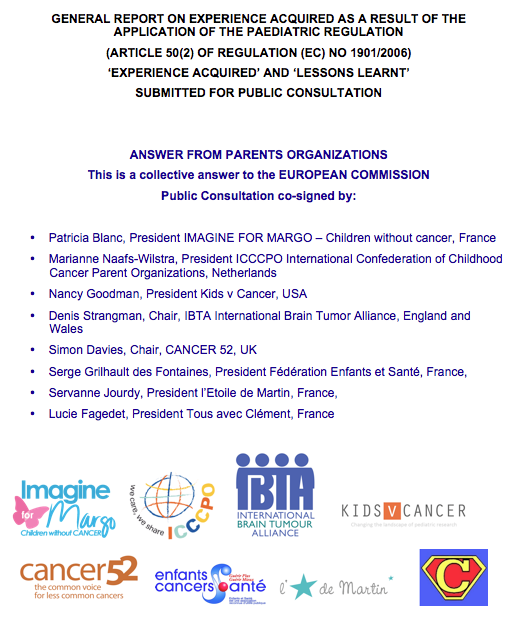 – In November, 2012: Pediatric Regulation: Imagine for Margo mobilize associations with the European Commission Imagine for Margo mobilized the representatives of 237 international associations to give a boost to development of new, specific and innovative medicine for childhood cancer. The European Commission initiated public consultations on Pediatric Regulation No. 1901/2006 to collect opinions and publish in early 2013 a report on its application. With no amendments in the law planned prior to 2017, it was a once-in-a-lifetime opportunity for parents’ associations to express their opinions on the improvements and changes required immediately, without waiting for 2017! The response to the public consultation, initiated by Imagines for Margo, was accepted and jointly signed by representatives of 237 French and international associations, who came together for maximum impact on members of Parliament. 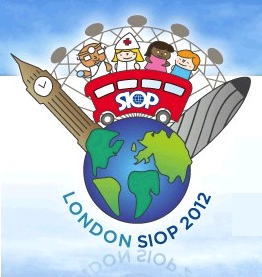 Together, GO, FIGHT, WIN – “Vas-y, bats toi, Gagne!” Our mobilization Complete text sent to the European Commission: Parents organizations response to Public Consultation – In October 5-7th, 2012: participation in the SIOP (International Society of Pediatric Oncology) Congress in London Annual Congress in London of the International Society of Pediatric Oncology (SIOP) 2012 SIOP Annual Congress in London Imagine for Margo attended this conference to better understand the challenges and developments in childhood cancer research. It was also the occasion to share our experience during an interview for the organization “Rare Cancer Europe” that will be published shortly. New medicine for children and adolescents: Where are we? What are the issues? Numerous discussions around better cooperation between researchers, pharmaceutical companies, parents’ associations and European and American legislators to more quickly develop innovative medicine and to insure better long-term follow-up of patients. This seminar led to agreement on 7 priority actions to be undertaken, all sources of hope. Researchers and European pediatricians, representatives of pharmaceutical companies, European and American legislators, parents’ associations.